1500 Supreme Collection Extra Soft Queen Sheets Set, Beige - Luxury Bed Sheets Set With Deep Pocket Wrinkle Free Hypoallergenic Bedding, Over 40 Colors, Queen Size, Beige by Sweet Home Collection at Shop For Less. MPN: NS-1500Q-BGE. Hurry! Limited time offer. Offer valid only while supplies last. Sweet home collection why choose us? at sweet home collection, we strive to create products using the finest textiles possible at reasonable prices. Sweet home collection why choose us? at sweet home collection, we strive to create products using the finest textiles possible at reasonable prices. We find techniques that include better stitching, stronger weaving, and more affordable materials. quality: Our 1500 supreme collection is a fine display of our commitment to quality and customer feedback. Our goal is to create repeat customers for years to come. Microfiber is paving the way for a future of fine linens using the latest technology. Used across all industries and growing in popularity, microfiber continues to get strong and more reliable every year. price: Compare our price to other similar products. At only $25, we are not only the best quality, but the best price as well. Easy on the wallet is one of our core values. shop With us: have a look at our entire sweet home collection bedding line to restore your bedroom. We provide your essential sheet sets, bed skirts, duvets, comforters, furniture protectors, and much more. Feel free to contact us so we can assist you. How we measure up: here are our measurements for bedding, queen: 1 flat (92"" x 102"") 1 fitted (60"" x 80"") and 2 Std pillow cases (20"" x 30""). King: 1 flat (102""x105"") 1 fitted (78""x80"") and 2 Std pillow cases (20""x40""). 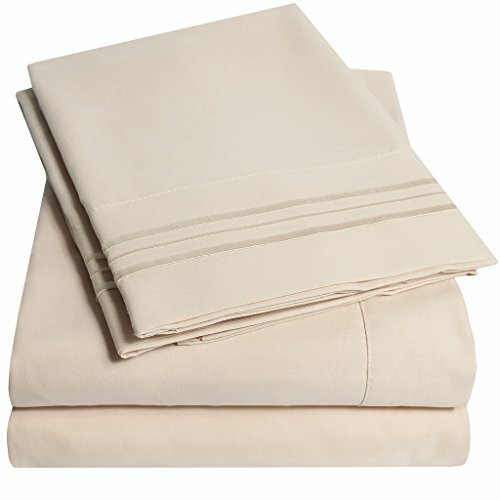 Cal king: 1 flat (108""x102"") 1 fitted (72""x84"") and 2 Std pillow cases (20""x40""). Full: 1 flat (81""x96"") 1 fitted (54""x75"") and 2 Std pillow cases (20""x30"") what's inside the package: the full, queen, king, and Cal king come with 1 fitted sheet, 1 flat sheet, and 2 pillowcases. The twin comes with 1 fitted sheet, 1 flat sheet, and 1 pillowcase. easy Care: feel free to wash on cold and tumble dry without having to iron after because our bedding is wrinkle resistant.